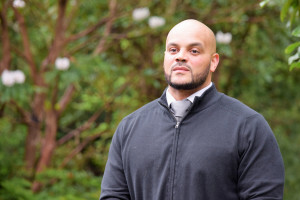 The Federal Way Youth Action Team (FWYAT), a collaboration between King County Juvenile Court and several Federal Way community programs, is growing its capacity for connecting youth to opportunities to grow into healthy and happy adults. Providing youth with life-changing support in Federal Way can start with something as simple as a basketball game. That’s what Game of Life founder Winston Bell knows to be true after using basketball games at the Federal Way Boys & Girls Club as a way to open youth up to conversations on the sidelines about mentorship, employment, mentorship and other life skills. “They come for basketball, but they’re able to get so many of the services people in the community are offering,” Bell recently told King County TV. Andre Bullard of the Positive Outcomes Program consults a young man off-court. The Game of Life is part of the Federal Way Youth Action Team (FWYAT), a collaboration between King County Juvenile Court and several Federal Way community programs that is growing its capacity to connect youth to positive opportunities. Youth referred to the program often end up having fun in other kinds of classes such as cooking and nutrition planning. At the heart of the team’s ability to connect to youth are credible messengers – adults who can relate to the youth’s life experience. Other community organizations that make up the team include the Positive Outcomes Program and HYPE (Helping Youth Produce Excellence). Jason Clark, Equity & Social Justice Advocate for King County Superior Court, says partnering with FWYAT helps Juvenile Court know where they can refer South King County youth to community programs. The team is searching for more mentors. As Positive Outcome Program coordinator Willard Jimerson said at a recent King County Council Committee hearing, services that connect youth to education and employment opportunities are much more effective with supportive, culturally appropriate relationships. To find out more about FWYAT or how to become a mentor, you can contact the programs and coordinators listed below. Youth Case Manager Will Jimerson Jr.